Emr1 exon 1 contains the translation initiation codon. 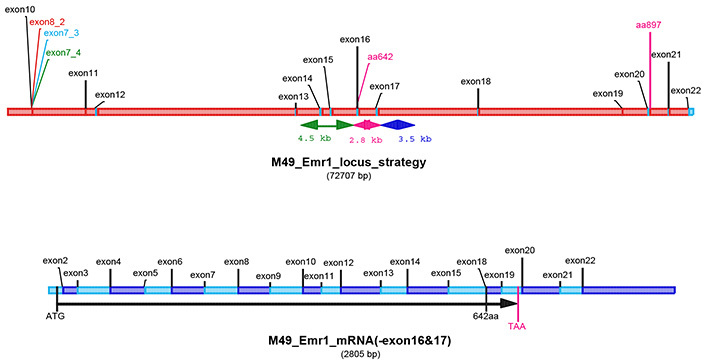 Exons 16-17 have been flanked by loxP sites. The conditional KO allele has been generated after Flp-mediated recombination by crossing chimeras to a Flp-Deleter on a C57BL/6 background. The conditional KO line has been subsequently backcrossed to C57BL/6NTac animals for at least 2 generations and the Flp-transgene was removed by segregation. The constitutive KO allele can be generated by Cre-mediated recombination. Deletion of exons 16-17 should result in loss of function of the Emr1 gene by generating a frameshift (premature stop codon in exon 19). Data mining and Design performed in 2005.